I am pretty sure a baseball was placed in my hand even before I could even walk by my father who is a newly-inducted Hall of Fame pitcher at St. Louis University. Well, needless to say, baseball became my passion. I played the game I love from when I was less than five years old all the way through high school. In grade school, I played on a team called the Astros. We played our home games at Affton Athletic Association and also played in various tournaments around the Midwest. 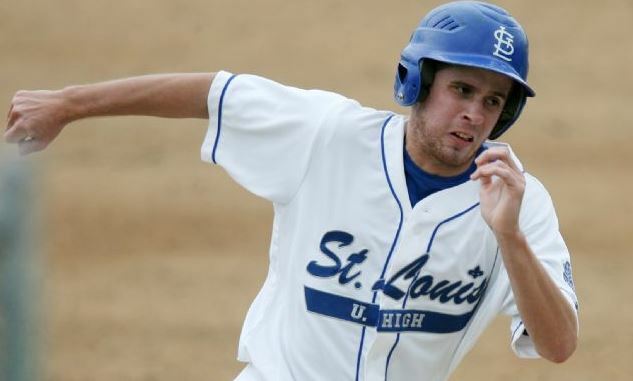 Once in high school, I played for my school, St. Louis University High (SLUH), during the school year and for Crestwood Legion during the summer. I was actually a pretty good pitcher my freshman and sophomore years at SLUH until I suffered a shoulder injury. The shoulder injury required surgery that would have ended my high school baseball career. Thus, I decided to rehabilitate it instead so that I could still at least bat, run, and play the field. As an aside, I just had the shoulder surgery this summer and am doing well in the recovery process. Well, being a pitcher all my life, I really was not the best hitter. It’s not because they DH’d for me, but rather, I just spent much of my time and effort focused on developing my pitches instead of focusing on hitting. Thus, with pitching out of the question, I really just became the go-to pinch runner and 4th-5th outfielder for SLUH. I must add, I was a pretty darn good base runner. My senior year, we were down by one run in the State Quarterfinals to Fort Zumwalt South. I entered the game in the 7th as a pinch runner and subsequently stole second and then third base. The FZS pitcher was dealing–striking out over 15 hitters that game. With me on third, he stuck with his slow, deliberate wind-up, and I begged my coach to let me attempt a steal home to tie the game. I almost convinced him, but he was far too conservative to allow me to try it. Well, our hitter ended up striking out and that is how my high school baseball career ended–90 feet away from tying the State Quarterfinal game. I posted this brief bio detailing parts of my baseball background because I feel like it will help readers find value in what I have to say in my blog posts. I have a strong background in baseball–I’m not just some critic who is able to write well enough to get a point across. Pitching was one of my main specialties back then, and it still is today. Thus, using my own knowledge combined with BrooksBaseball.net, many of my articles will be breaking down my favorite part of the game–pitching.